Hey guys, been reading the forum for a bit and decided it was my kinda place so I decided to join. You seem like a great bunch. My name is Forrest, I am 34 and live in lynchburg va, I have been persuing game for the better part of 24 years. I went bow only 10 years ago and made the switch to a recurve 3 years ago and have never looked back! 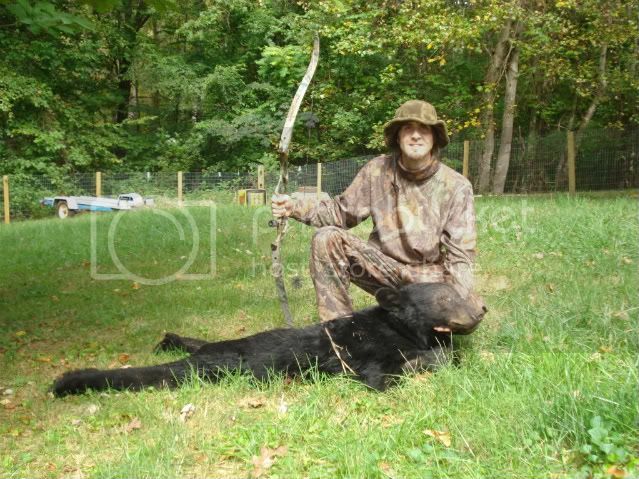 Here is a picture of my opening day bear, harvested in the George Washington National Forest. I am looking forward to getting his age back from the DGIF, it is estimated that he is 12-15 years old. We had to cut into his gum to get to the tooth to be removed it was so warn down. I live in Chesapeake but me and my dad do allot of hunting only 20 minutes from Lynchburg in Appomottox county. Its good to no theres some more traditional bowman around those parts. Welcome to the Gang and congratulations on the bear. Let us know his age when you find out. Looks like you've spent a good portion of your life in the outdoors. I look forward to reading more of you traditional hunting stories. You have found the best traditional hunting site on the web. Here is a pic of the bear, resized of course! Welcome from Kentucky Forrest. Great bear. Welcome and congrats on the bear Forrest. nice bear, sure looks old!! Welcome you found a great place to hang around.